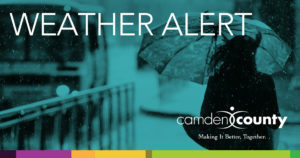 (Lindenwold, NJ) – Camden County is diligently monitoring the developments of a storm system threatening to deliver three to five inches of snow to our region tomorrow. Preparations are already underway to respond to the inclement conditions and keep traffic moving throughout the region. A slight westward shift in the storm system is on track to deliver higher snow totals on Saturday. The duration of the storm could be long, with snowfall possible for 12 to 24 hours with predominately light to moderate intensity. By the time this weather event is done, Camden County could see snow accumulation totals of between three to five inches.